Find helpful tips to combat senior sleep issues here. Staring at the clock. Tossing and turning. Counting sheep. If this describes a common evening for your aging loved one, recognize that he or she is far from alone. While older adults need to have at least seven hours of sleep each night, upwards of half of all older adults report issues with falling and/or staying asleep. Yet it’s significant to note that despite the fact that senior sleep problems may be prevalent, they are not a normal part of aging – and there are steps that can be taken to improve sleep for your senior loved ones. An environment that’s not conducive to sleeping. Make sure the senior’s bedroom is quiet, dark, and cool. Take out the television set and any electronics from the bedroom, and maintain a regular sleep routine that includes soothing music, a warm bath, reading, or any other calming activities, in addition to a set time to go to bed every evening. Medication side effects. Evaluate any medicines your loved one is taking – both prescription and non-prescription – to find out if sleep disruptions could arise, and then talk with the senior’s doctor about whether any medication adjustments are required. An inactive way of life. Being as active as possible through the day can positively influence a healthier night’s sleep. Encourage your senior loved one to register for an exercise class, take a daily walk each morning, or join a local pool and make an effort to swim each day (all with the doctor’s approval). Chronic disease complications. Medical conditions such as Alzheimer’s, diabetes, arthritis, and more can produce senior sleep disruptions. Consult with the senior’s physician for recommendations. Post-menopause. 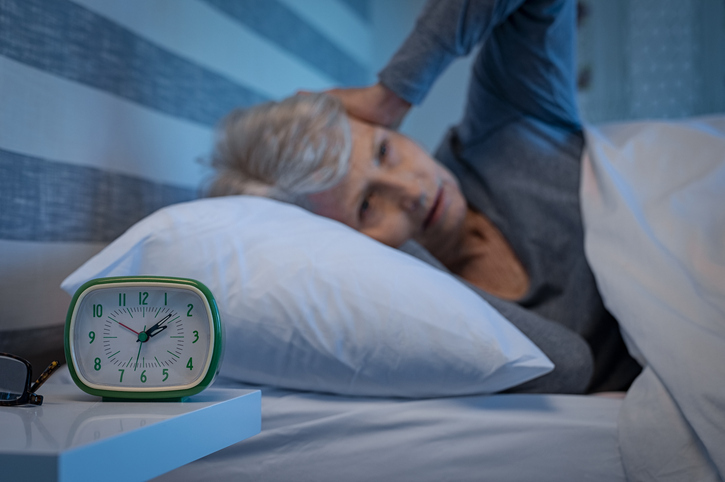 It’s common knowledge that the hot flashes often occurring in the course of menopause can impede sleep, but hormone-related sleep struggles can continue well beyond menopause as well. The lifestyle changes outlined above might help. As providers of the top home care services in St. Louis and surrounding areas, Compassionate Nursing Services can assist with senior sleep difficulties in a number of ways as well. Reach out to us at 314-432-4312 to arrange for a free in-home meeting to learn more! And visit our Service Area page to find out if our professional home care services for seniors are available in your area.